Dominating the bustling Millennium Square, The Electric Press, built around 1840, offers a fantastic selection of cuisines, from Italian to Indian, Asian to modern British, there's something to suit the most demanding of taste buds. 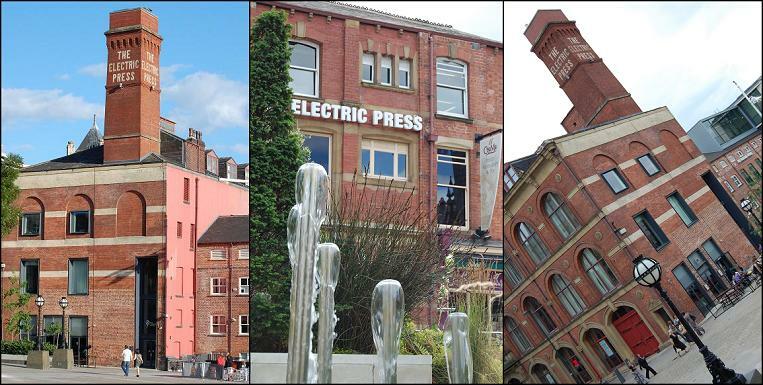 Home to Epernay, All Bar One, Revolution, Spice Quarter, Red Chilli, Dish and Casa Mia, The Electric Press offers drinking and dining solutions for breakfast through to supper. There's extensive outdoor seating for Al Fresco dining, as well as a glazed, heated courtyard area, making it an ideal location for a coffee with friends or a cocktail after hours. Epernay Champagne Bar, the city's only champagne and cocktail bar boasts over 100 champagnes, more than 30 carefully selected rare and exclusive wines and over 70 cocktails. Afternoon Tea is also served daily. The stylish, spacious interior is perfect for drinking through to the early hours, or simply relaxing on the beautiful terrace, when the bar comes into its own. For those looking to really let their hair down, Revolution Bar is the place to do it! Home to a wide range of cocktails, classic bar food, guest DJs, themed nights, and special promotions make for a lively night out. Spice Quarter offers Indian, Italian, Thai and Chinese dishes for those who can't quite decide what they fancy! With a selection of up to 100 different dishes, along with live cooking stations and regular entertainment, Spice Quarter provides a lively dining experience. For lovers of classic Italian dishes, independent restaurant, Casa Mia Millennium offers fine dining over two floors and also includes a coffee bar, deli, and extensive outdoor seating. The vast menu, includes classic pasta dishes, fresh fish and seafood and an extensive pizza menu. All Bar One Millennium Square has a stylish setting that offers fantastic menus for breakfast, lunch or a relaxing evening meal complemented by an extensive range of beers, wines from around the world, soft drinks and cocktails. For connoisseurs of the finest in Beijing and Sichuan dishes, Red Chilli has an extensive menu, with familiar dishes such as Sizzling Beef Fillet with Black Pepper Sauce, and some lesser known delicacies, including Stir Fried Frog's Legs with Cucumber in Tomato Sauce and Braised Pig's Leg in Hot Spicy Sauce. The latest addition to The Electric Press, Dish Dining Room & Bar, is a vibrant, modern dining room and cocktail bar in the heart of Leeds, in a Grade II listed building featuring an original Georgian interior and offering modern British dining, with wine, beers and spirits to match. Finally, The Electric Press is also home to The Carriageworks Theatre which showcases some of the best national and regional performances. For venue opening times and details of events visit www.electricpressuk.com, or follow at twitter.com/electricleeds and facebook.com/theelectricpress.